Description: The 1979 viola concerto, written for Pinchas Zuckerman who premiered it in 1984, was Rózsa's last orchestral work. Ruminative and brooding in its first and third movements (the latter a nocturne typical of the composer), it finishes up with a peasant-style finale with folk fiddling transformed in to virtuosic display. 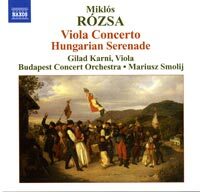 Gilad Karni (viola), Budapest Concert Orchestra MÁV; Mariusz Smolij.